skiing, snowshoeing and ice fishing. Algonquin Park, Ont. — One week into January and already I was sick of winter. I had shovelled a miniature Matterhorn of snow onto my front lawn in Toronto, helped push cars through unplowed streets and spent frozen hours waiting in vain for stranded streetcars. Forecasters were calling for more of the same: more snow, more high winds, more sub-zero temperatures.All my sane friends planned to spend the weekend close to a fireplace, reading a book or watching videos. So why was I leaving the city for a “multi-adventure experience” in a wintry wilderness? Why was I risking cold feet, numb fingers and frostbitten cheeks to take part in activities that might well be beyond my levels of ability and endurance? Because, I reminded myself, it had sounded like a good idea on the warm day in autumn when I made the booking with Call of the Wild Tours. Now I wasn’t so sure, especially since the tour itinerary called for a 7:30 a.m. departure. Still, my frigid spirits started to thaw once I joined my travelling companions on a Friday morning at Toronto’s most northerly subway station. We became fast friends during the morning-long drive north to Algonquin Park, a 7,600-square-kilometre tract of lakes, forests and wild animals, buried, at this time of year, beneath snow and ice. It was good we had that time to bond. Our weekend tour, lasting three days and two nights, would be short but intense. We would spend much of the time together, dogsledding, cross-country skiing, snowshoeing, visiting a wolf research station and catching our breath at a cozy back-country lodge. Robin Banerjee, Call of the Wild’s founder, was our tour-van driver, guide and host. He had also been a substitute mother in advance, sending us detailed instructions on what to wear and what to pack. Winter is not cold, he told us, if you put on enough layers and arrange them in the proper order. There was no need, he added, to buy a lot of fashionable gear. Most Canadians can find all the things they need at home or borrow them from friends. Most important of all, always wear a hat. I followed his advice to the letter and was toasty warm all weekend. Of the entire weekend’s events, it was only my Friday afternoon adventure, driving my own sled and team of four huskies, that I had been dreading. I had visions of unruly dogs racing out of control, dragging me deep into the bush. I had also expected dogs with attitude: snarling brutes that would battle with each other and growl at humans. In fact, the Alaskan and Siberian huskies, waiting for us on Sunday Lake Road inside the park, were for the most part as gentle as lap dogs. We started with a crash course that required me to stand on two runners protruding behind a wooden sled, holding onto a curved hand-bar at all times. If the team took off without me, I was told, they would complete the 15-kilometre course on their own and I would be walking back. I was to slow the dogs down by pressing my feet on a “brake” and to control them by shouting verbal commands that the two lead dogs are trained to understand. “Pick it up,” means go forward, “gee” is right, “haw” is left, “whoa” means stop. The lead dogs — Martin and Junkyard in my case — are the brains of a team. The wheel dogs are the brawn. We followed a hard-packed path in single file, with a guide driving the front team. He more than earned his pay: Anchoring his sled from time to time, he would rush back to break up dog tiffs, to rescue huskies with their legs tangled in ropes or to catch runaway teams. Ours was the easy part. 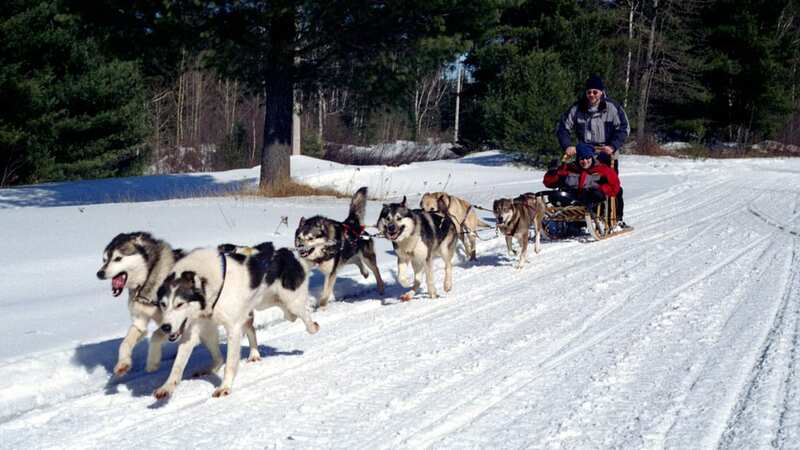 Driving a dogsled is as simple and as thrilling as riding a toboggan. Yes, I managed to tumble off a few times, but the snow was soft and forgiving. I even committed the ultimate faux pas of letting go of my sled briefly, but Martin and Junkyard showed pity and waited for me to catch up. Algonquin Nordic Wilderness Lodge, where we slept both nights, was also our base for cross-country skiing on Saturday and snowshoeing on Sunday morning. A former hunting lodge just outside the park’s boundary, it’s operated as a labour of love by Mark Arbogast, who also teaches fitness and recreation at Peterborough’s Sir Sandford Fleming College. Open only in the fall and winter, and then only on weekends, it is a rustic, romantic and eco-friendly spot, sheathed in warm pine panelling. It has oak floors and a dining room/lounge with wood stove where everyone gathers for conversation. Located 2.7 kilometres from the parking lot, the only ways in are by foot or skis. The lodge is rustic in every sense. The 16 guest rooms are in the main building (where the washrooms are) or in an outlying cabin without plumbing. Guests use sleeping bags (rentals are available in advance to tour members); the propane lights go out about 10:30 p.m. (but not the battery ones in the rooms); and the garden-pail showers provide only about two minutes of hot water. The lodge serves huge breakfasts and a filling-if-not fancy Saturday night dinner. It also sets out fixings for make-your-own lunches each morning. On the first night, when the lodge’s kitchen was closed, Robin cooked chili for our group. The alcohol policy is BYOB. On Saturday, our cross-country skiing expedition started with a half-hour lesson, great for beginners or someone like me who last took training in the early seventies. The 10-kilometre route we followed was reasonably flat and led us to a heated tent where we stopped for lunch. Snow on the evergreens sparkled in the sunlight, reminding me of all those songs that rhyme “glisten” with “listen.” If you must be in Canada for the winter, I thought, this is the way to appreciate it. Back at the lodge, we soothed our muscles in the sauna and the three-person outdoor hot tub, both heated by wood fires. The lodge has a tradition — encouraged but not required — of hot tub users, clad only in bathing suits, lying down in the cold, white stuff to make snow angels. Of all the outdoor adventures on offer that weekend, that was the only one I declined to take part in. On Saturday night the cloudless canopy sky pulsated with uncountable stars, a sight never seen or imagined in large cities. We stepped outside to gaze in wonder, but not for long. The thermometer had plummeted to -30 C.
It was clear and sunny on Sunday morning, and so cold that the snow squeaked loudly beneath our feet. No problem. We just added an extra layer of clothing before setting off into the woods on snowshoes. I opted for a pair of traditional “beavertails” with leather webbing stretched on a wooden frame that resembled a tennis racket. The “handles” trailed behind me, keeping me on a straight course but making it difficult to turn around. Others in our group went for smaller, modern variations that are easier to manoeuvre. Where the snow was already beaten down, the shoes served little purpose. But we had only to step off the trail to see how they made us float on top of the loose drifts. Our final wintertime thrill came at the Haliburton Forest Wolf Centre. From the coziness of a heated interpretive centre we looked out through one-way glass at a snowy landscape red with tooth and claw. A pack of seven western grey wolves were tearing apart their weekly meal — the scrap tails and innards of beavers purchased from local trappers. Beaver, we were told, is also the staple of the eastern grey wolves indigenous to the area. Occasionally the captive pack are fed deer or even moose, provided it’s available as roadkill. The alpha male and female ate first, driving the others away until they had their fill. Gigantic ravens lurked close by, waiting for leftovers. Except for the vicious teeth, the wolves resembled the gentle huskies that had pulled our sled just two days earlier. Had we really done so much in so short a time? And enjoyed it? In winter, in Canada?. Two hours north of Toronto, while Robin was driving us home, we hit a blizzard. By the time I reached my house, the sidewalks were heaped with fresh snow. Immediately I set to work with a shovel. For the first time in three days, I felt the cold. Call of the Wild will offer three-day dogsledding, cross-country skiing and snowshoeing trips with accommodation at Algonquin Nordic Wilderness Lodge starting Jan. 29, Feb. 26 and March 12. The price is $450 plus GST including transportation from Toronto. A similar tour with motel accommodation sells for $365 and will be offered on Feb. 19 and March 26. Contact Call of the Wild at 23 Edward St., Markham, Ont., L3P 2N9, phone (905) 471-WILD or (800) 776-WILD, Internet https://www.CallOfTheWild.ca .